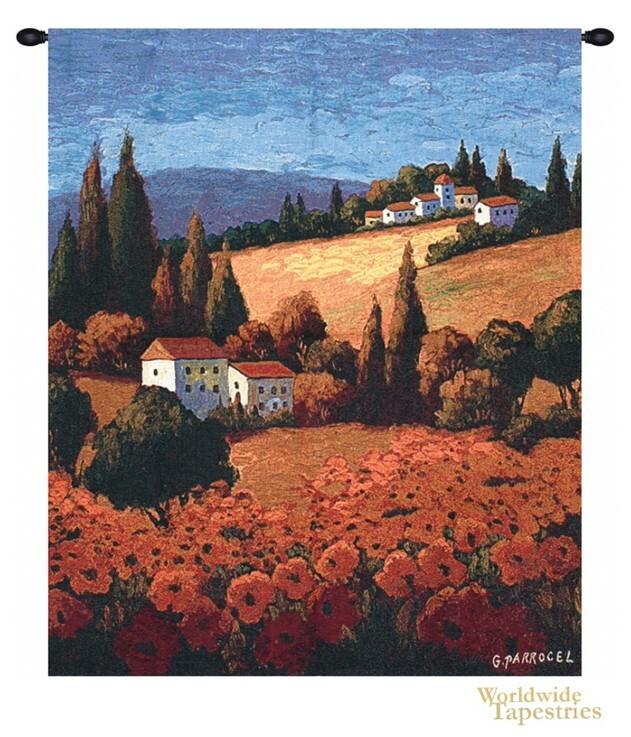 This tapestry “Tuscan Poppies” shows the artwork of Parrocel. Here we see a scene of the Tuscan countryside with its typical poplar trees, fields of poppies and gorgeous Tuscan homes. The golden glow of the countryside is evident and the work is stylised representation of the beauty of the Italian countryside in Tuscany which has captured the attention of artists for ages. This Tuscan landscape tapestry “Tuscan Poppies” comes complete with lining and has a tunnel for easy hanging. Note: tapestry rod and tassels, where pictured, are purchased separately. Dimensions: W 35" x H 41"